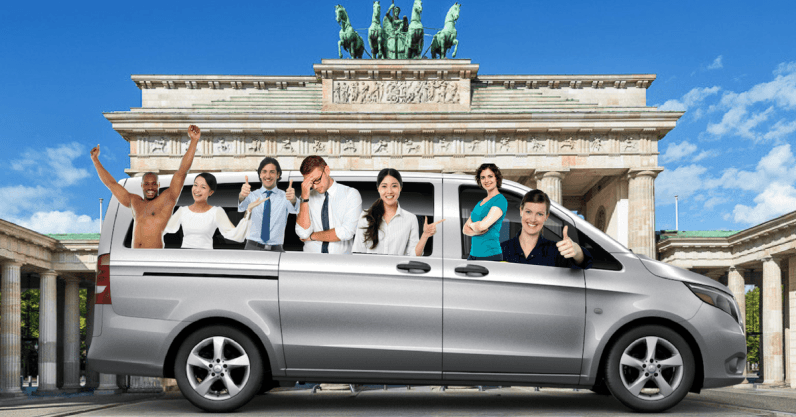 At 5pm today, Berliners get the get the chance to try a brand new carpooling service. 25 shuttle cars will hit the streets, offering shared rides to up to five passengers at a time. Oh yeah, and it’s free..
Carpooling offers the same features as conventional ride-sharing, but is often vastly cheaperThe initiative will run for three months, and is from mobility platform startup Door2Door, and Germany’s largest automobile club, Allgemeine Deutsche Automobil-Club (ADAC). Door2Door provides the algorithms behind the project and ADAC the vehicles and, most importantly, the funding. The project aims to start a conversation about the future of public transport and how smart cities of the future are designed. Door2Door and ADAC want their free carpooling project to be an example of how a future smart city can plan its public transportation systems. Carpoooling isn’t new in itself. Uber’s offering, UberPool, launched back in August, 2014, allowing passengers to share the same car going in the same direction. Lyft’s alternative, Lyft Line, debuted in the same month. Carpooling offers the same features as conventional ride-sharing, but is often vastly cheaper. An effective implementation of carpooling can, in the long run, also contribute to positive change for a city. For instance it can cause less traffic jams, fewer emissions and a significantly decreased need of parking areas. The latter being a never-ending problem for most cities and constant nut for urban planners to crack. What makes Door2Door special? Founder and managing director Dr Tom Kirschbaum, argues that Door2Door distinguish themselves apart from Uber and Lyft by turning their focus towards the public rather than the private transport sector. Door2Door wants their system to be used by municipalities and governments. Uber disrupted the taxi industry, but the public transport industry has not seen any comparable disruption or digitization. We believe that smart cities should have smart public transport systems, that match the age we live in. And that is currently not the case. But does it ultimately matter if the possibility of carpooling is provided by a private or a public company? The three-month free pilot will be a way for people in Berlin to get a taste of this mode of transportation. Uptake should be good, considering it’s free. But what about after those three months of free carpooling bliss? Kirschbaum admits that it is not possible for them to indefinitely continue a system like this for free, nor to guarantee that it will someday be free. But they want to show that having free carpooling as part of a public transport system can be a solution to the smart cities of the future. “It’s simply the smartest thing”, Kirschbaum argues. “If implemented correctly, a system like ours can be so effective and convenient that people can ultimately decide against owning personal cars, because this system is better”. The idea is interesting, if not a bit utopian. The free three-month pilot starts at 4pm (GMT+1) today in Berlin. It will run every Friday and Saturday from 5pm to 1am, giving young early-adapters the chance to among the first to try it out.